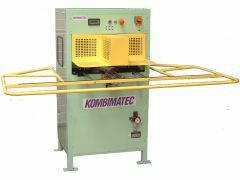 Kombimatec EV443cnc 25 shape corner cleaner, fitted with two 3,0 mm wide grooving knives, milling blade controlled by 2 Axis full CNC servo driven accommodating up to 25 different programs, linear guides, recirculating ballscrews, electronic display for program selection, programming via laptop, and complete with support table. Popular and flexible CNC. References available.